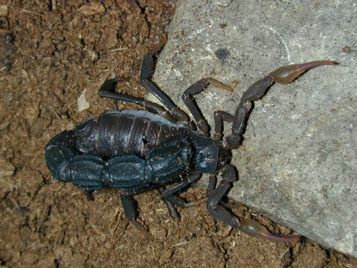 This species is sometime known as "The South African Fattail Scorpion". Africa (Botswana, Mozambique, South Africa, Zimbabwe). Hot and dry deserts and scrublands, but also in semi-arid regions. This species hide in burrows, under stones, logs etc. Medical data indicate that this species has a strong venom and is medical significant. In a study in Zimbabwe, 63 % of the stings of this species resulted in intense pain only. 27 % of the stings resulted in minor systematic envenomation (hypersalivation, sweating and subjective neurological complaints). Severe scorpionism was seen in 10 % of the cases (neuromuscular symptoms with significant parasympathetic nervous system and cardiac involvment). Fatality rate was 0.3 % with deaths in children below 10 years and adults above 50 years. The cadiac involvment in P. transvaalicus envenomations differ from general buthid scorpionisms. Use of species specific antivenom seem to have a positive therapeutic effect. LD 50 value for this species is reported to be 4.25 mg/kg. 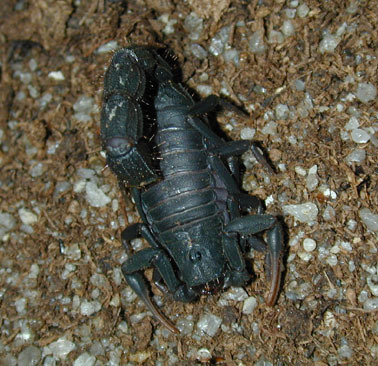 Due to it size, this scorpion can inject very large amounts of venom. NB! This species is able to squirt venom up to one meter away, and venom in the eyes can be very dangerous. Safty glasses is reccomended when dealing with this species. The medical significance of this species has been discussed. The Zimbabwe study indicates that P. transvaalicus should be treated as a dangerous species with a potential life-treatning venom. Bergman, N.J. (1997). Clinical description of Parabuthus transvaalicus scorpionism in Zimbabwe. Toxicon, 35 (5), pp. 759-771. Gaban, D. (1997). On: Parabuthus transvaalicus (Purcell). Forum American Tarantula Society, 6 (5), pp. 157-158. Newlands, G. (1974). The venom-squirting ability of Parabuthus scorpions (Arachnida:Buthidae). South African Journal of Medical Sciences 39: 175-178. Saunders, C. R. (1990). "Beware of the scorpion Parabuthus." Centr. African J. Med. 36(4): 114-115. Abstract of an article about Parabuthus venom i S-Africa. This spcies is one of the largest members of the buthid family, and can be up to 15 cm long (8.5- 15 cm). This species is blackish/brown (some colorvariations are possible), with redbrown pincers. Pedipals and legs are lighter in color. A powerful cauda with numerous redish hairs. Small, slender pincers. No subacular tooth on telson. This species is reccorded in pet collections, both in US and Europe. This species is dangerous, and should only be kept by researchers and experienced keepers. No current research on the species is known.